Right now there are more James Bond rumors flying around than anyone can possibly keep up with, but it is all hinging on the idea that it seems like Daniel Craig is leaning towards not coming back for another go as 007. With word around town being that Craig turned down nearly $100 million for two more films, all eyes are on who will be taking up the mantle next should it come to pass that Craig is actually done with Bond. 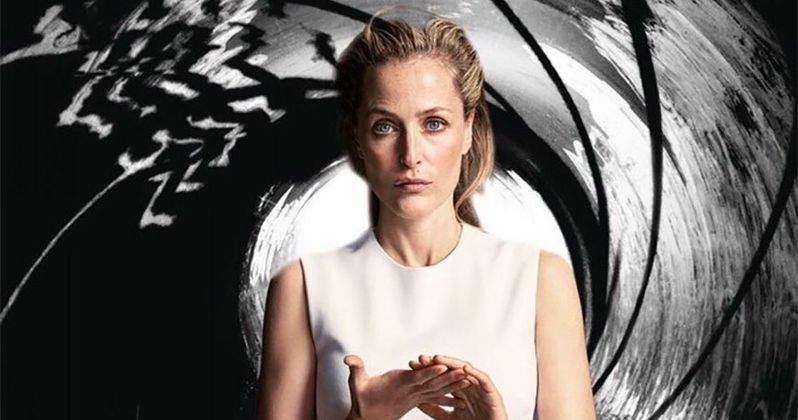 A hashtag #NextBond started on Twitter for fans to voice who they think would make for the best new Bond, and a very interesting choice came up in the form of X-Files star Gillian Anderson. An unknown internet fan decided to make a James Bond movie poster with Anderson featured as Bond in it and it actually got a lot of traction on Twitter, getting shared thousands of times with much of the reaction to the outside of the box idea being very positive. Anderson took to Twitter herself to respond to the fan push, seeming to be open to the idea as completely unlikely as it would be. "It's Bond. Jane Bond. Thanks for all the votes! (And sorry, don't know who made poster but I love it!) #NextBond" Anderson said. Obviously, there is almost no way that the producers of the Bond series would cast a woman in the role, as Anderson herself joked that it is not Jane Bond, but it is James Bond, after all. Though, there have been plenty of examples over the years of social media campaigns getting the attention of producers, so it is possible that all of the fan attention could put Anderson on the radar of Sony and MGM, but that doesn't mean she would get the role of 007. However, Anderson could fit into the world of Bond as another 00 agent at MI6 or maybe even a villain. This is of course wild and outlandish speculation, but it isn't exactly that hard to imagine. Along with the rumors that Craig has turned down a ton of money with conflicting reports that the actor has yet to make a decision firmly one way or the other, a frontrunner to take over for him has emerged and spoiler alert, it is not Anderson, or any X-Files star for that matter. Last week, bookies were actually forced to stop taking bets on Thor star Tom Hiddleston because the odds tilted so far in his favor that it appears to many he essentially already had the role if Craig doesn't come back. One Irish bookie had even said that he wouldn't be surprised if an announcement were made any day now and Hiddleston himself has publicly stated that he would happily take on the mantle of 007. Other actors that have been rumored for the role in recent months, which also came up with the #NextBond hashtag included Luther star Idris Elba, Homeland star Damian Lewis, one of the busiest men in Hollywood Tom Hardy and the seemingly very obvious choice, Michael Fassbender. Should MGM and Sony be forced to recast the role, it would be helpful to make a bold choice for Bond in order to try and distance themselves from the Daniel Craig era, just maybe not a Jane Bond level of departure. In any case the producers have made it clear that another Bond film won't be due until late 2018 at the earliest, so it may be quite some time before we hear anything solid.